Discover Florida’s Hidden Gems for Canadian Snowbirds! Many Canadian snowbirds spend several months in Florida over the winter, and while some tend to stay put wherever they have bought a second home, rented accommodations or parked their RV, others like to discover new parts of the state. Florida’s many man-made attractions are well known and a great place to take visiting family and friends, as are popular cities and towns along Florida’s coastline. But there’s another Florida just waiting to be discovered – some call it “Old Florida” but we like to think of it as “the Other Florida”. This is the Florida that most tourists will never see - and that’s a pity, because this “other Florida” has some amazing experiences in store for those who venture off the Interstates and away from the well known theme parks and beaches. In fact, there’s so much to see and discover in “the Other Florida” that we have divided the State up into four regions to help snowbirds discover these wonderful but lesser known hidden gems. This guide takes a look at Florida’s West Coast and Central Florida. Stay tuned for future guides on other parts of the state! Crystal River is a place where you can watch and even swim with manatees when they leave the Gulf of Mexico for the warmer waters of the river. In fact, this is the only place where it is permitted to swim with manatees in the wild. Located on Florida’s northwest Gulf Coast in Citrus County, the many beautiful local springs keep the water temperatures warm even in winter, attracting not only manatees but many swimmers as well. The rivers and springs are also great for kayaking and canoeing, and you can even take tours or boat cruises of the area if you prefer. Florida is not only home to lots of snowbirds from Canada - it is also the winter home of many of North America’s finest thoroughbred racehorses and breeding stock, as well as show jumpers and other show horses. The rolling hills around Ocala are home to many horse farms and each year there is an influx of horses and coaches and trainers who spend their winters there. Located in north central Florida, Ocala is on many snowbirds’ driving routes south, and it’s well worth spending some time there or attending a horse show on the Grapefruit Circuit in the winter months. The countryside is picturesque with miles of wood fences around pastures, paddocks and barnyards, and the many oak trees in the area all have wonderful hanging Spanish moss. While you are there, you might also want to visit the massive sand pine forest located nearby, or Silver Springs, a nature theme park. North of Ocala lays a unique experience for Florida - The Canyons Zip Line & Canopy Tours – occupying over 100 acres of parkland that includes forests, cliffs, lakes and canyons. There are 9 zip lines, 2 rope bridges and a rappel for those brave enough to try it! Travel for over a mile on a zip line – or you can opt for horseback riding through the park. This town, located north of Tampa, was once known as the Sponge Capital of America. Its largely Greek American inhabitants keep up their traditions today, and the town boasts the highest percentage of Greek Americans of anywhere in the U.S. While the sponge industry was killed off by red tide algae, today many of the residents are fisherman and shrimpers. You can enjoy Greek baked goods and gift shops while discovering the interesting history of this town. We’ve already mentioned Myakka State Park in our Florida Attractions article, but it’s worth mentioning again here as it offers such a unique Florida experience. Located just south of Sarasota, Myakka State Park is one of the oldest and largest state parks. The Myakka River runs through a large protected area of wetlands, prairies, and forests. There’s a boardwalk over the Upper Myakka Lake, as well as a canopy walk. Deep Hole is an enormous sinkhole located in the park where hundreds of alligators congregate. The hole is not always open to the public but if you are lucky, you may get to see it. Visitors can also explore the river and lakes for boating, fishing, canoeing, and kayaking, and there’s also a boat ramp if you bring your own boat. The park is great for hikers, who can explore the trails in the prairie landscapes. Air boat tours of the lake and a safari tram that takes visitors through the park are also available. Lovely Gasparilla Island is part of a chain of Gulf Coast barrier islands that extend down the West coast of Florida. 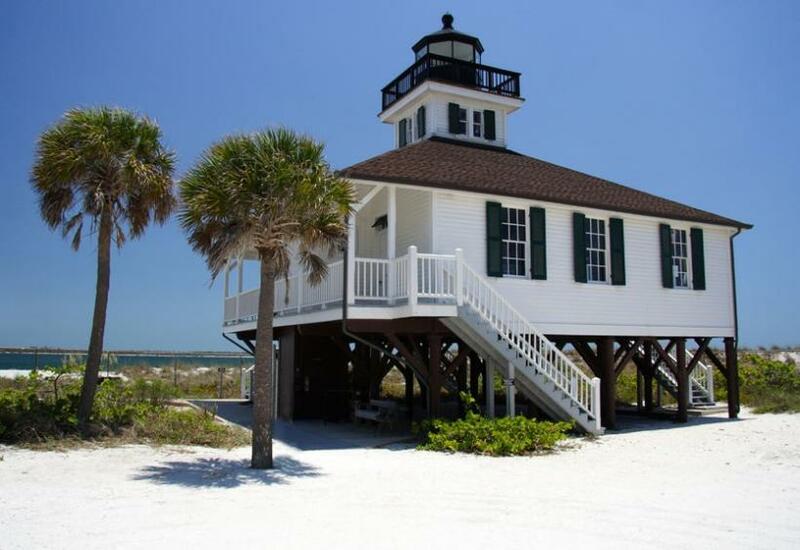 It is home to Boca Grande, some wonderful beachfront properties and some serious “old money” family homes, as well as Gasparilla Island state park. There is a restored lighthouse and museum at the southern tip that is open to the public - the Port Boca Grande Lighthouse was built in 1890. Visitors can park nearby and enjoy the white sand beaches for swimming, snorkeling or fishing. The beaches of Gasparilla Island are also a favourite with shell collectors. The island is perfect for cycling and has great cycling trails. It is also ideal for hiking, canoeing and kayaking. Although not exactly off the beaten track, many snowbirds have never crossed the bridge from Ft. Myers over to Sanibel Island, but it is well worth the trip. Yes, Sanibel has hotels and restaurants and is famous as one of the best shelling places anywhere, but it is also home to many species in their natural habitat as over half the island belongs to the Ding Darling National Wildlife Refuge. Although downtown Sarasota is anything but off the beaten track, it is home to a special oasis many visitors are unaware of that is a must-see if you are anywhere near Sarasota. The Marie Selby Botanical Gardens overlook Sarasota Bay, spanning nine beautiful acres with more than 20,000 varieties of plants in the different garden areas. The garden also houses 6,000 orchids, a banyan grove, a bamboo pavilion and butterfly garden. Be sure to take a guided walking tour of the gardens to learn about the many plants and trees of South Florida.